“I’m considering everything,” Trump said Tuesday, opening a likely new phase in his struggle to fulfill his quintessential campaign promise, which could trigger constitutional and legal battles over the limits of presidential power. In many ways, it’s an apt finale for the drama over the wall on the US-Mexico border, reconciling multiple, converging strands of Trump’s presidency, political brand, willingness to shatter the norms of his office, and personality. As soon as he assumed the presidency, Trump began to fracture the guardrails of his office. He’s often shown indifference and even contempt for constitutional processes and has lacked the patience or the institutional dexterity to pilot his own agenda through the stormy seas of Congress. From his days as a young developer on the make to his starring role in NBC’s “The Apprentice,” Trump has styled himself as the big man barking orders and getting things done. That persona was part of the mystique that he sold to voters in 2016, and it’s still the context in which he seems comfortable. Almost every day, Trump presents the image of a brash CEO surrounded by subordinates or petitioners, in Oval Office photo ops, Cabinet meetings and trips to visit the military and disaster workers. And yet he could have gotten a better deal in December than the $1.375 billion in funding for 55 miles of border barriers in the new congressional compromise, even before sparking a partial government shutdown over the wall. In office, Trump’s imperious instincts often translate into a zeal for maximizing presidential power. He’s run afoul of the courts — for instance, when he sought to impose a travel ban on citizens of mostly Muslim nations early in 2017. A watered-down version of the order was later upheld by the Supreme Court. Trump’s legal advisers also made an expansive assessment of presidential power by claiming he cannot obstruct justice, as he’s constitutionally designated as the nation’s top law enforcement officer. In signing the deal, Trump would spare himself another damaging shutdown, and his friends in Congress have acknowledged he lacks leverage. “I think he will sign it. … I think he’ll do so reluctantly,” said Trump’s ally Rep. Mark Meadows, a North Carolina Republican. Trump often responds to a political reversal or roadblock by escalating a situation, forcing others to react to his exercising of power. By using executive orders to reprogram government funds already appropriated by Congress, or by taking a step further by declaring a national emergency, Trump could grab back the initiative. He could unite angry conservative pundits behind him and delight supporters who chant “Build the wall!” at his rallies. Trump would satisfy his own craving for action and his self-image as a strongman disdainful of the establishment. There’s only one problem: Such a step may be illegal and unconstitutional, and stretch the conventional understanding of presidential power beyond its limits. It’s not that Trump would be the first president to claim vast executive powers or to declare national emergencies to grant himself extra heft. President Abraham Lincoln suspended the writ of habeas corpus in the Civil War. President Franklin D. Roosevelt claimed emergency powers to fight the Great Depression and World War II. President George W. Bush adopted an expansive concept of White House power after 9/11. President Barack Obama used executive action to shield some undocumented immigrants from deportation. “You know, President Obama, President Clinton, President Bush, they’ve declared many national emergencies. Many, many,” Trump said Tuesday. Declaring a national emergency to build a wall would not be a simple matter, however. It would stretch the definition of a national emergency beyond any previous point and trigger challenges in Congress and the courts. Even if Trump decides to start with less broad executive action to reprogram several billions of dollars in Pentagon, Treasury and Department of Homeland Security funds, he could hit legal and political trouble. Such action could be seen as infringing on Congress’ power of the purse and its prerogative to reject a legislative demand from the President. “It would be very clear that Congress has frustrated his request for wall funding and that he has decided to do an end run around Congress’ appropriation authority,” said Matthew Dallek, a specialist in presidential power at the Graduate School of Political Management at George Washington University. Trump’s opponents could invoke the precedent set by President Harry Truman’s decision to seize control of steel mills over a labor dispute that threatened to harm US military readiness during the Korean War. In what became known as the Youngstown decision, the Supreme Court held that Truman threatened the constitutional equilibrium by issuing an executive order that was incompatible with the expressed will of Congress. “There is a parallel in the deal in principle drafted — Congress considered granting him money for the wall and decided against it, as they have several times previously,” he said. If Trump goes with the national emergency, the White House will likely argue that he is acting in line with the National Emergencies Act of 1976. But most previous national emergencies covered contingencies like sanctions on foreign entities during conflicts, public health crises or attempts to stem the proliferation of weapons of mass destruction. So far, immigration has not been considered within that class of crises. And while the act doesn’t define a national emergency, there is no recent precedent that is quite as politicized as Trump’s would be. “Usually in big national crises, if it looks like a duck and quacks like a duck it’s a duck. There has been no clear political manipulation of the emergency powers in recent times, in such a bald-faced way,” said Dallek. Trump is often impatient at how long it takes to get things done in Washington, with its ingrained procedures and political divides. He might be dismayed to learn that a satisfying eruption of executive power may not suddenly lead to foundations being dug on the southern border. Congress has the right under the 1976 legislation to seek to terminate a declaration of national emergency by passing resolutions. 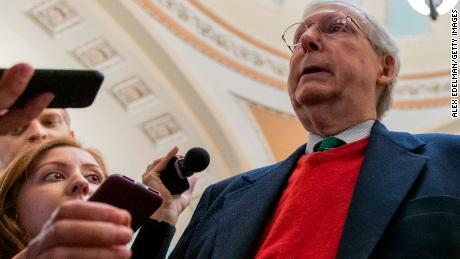 Democrats in the House would be sure to try, and Senate Majority Leader Mitch McConnell would have no choice but to follow in a scenario that may not end by canceling a presidential veto but could expose Republican splits over the wall. Some Republicans are queasy about what a future Democratic president might do with Trump’s precedent — on base-pleasing issues such as gun control or climate change. Trump opponents are also readying lawsuits despite laws that White House experts interpret to argue that Trump has legal grounds to shift around already appropriated money during national emergencies. 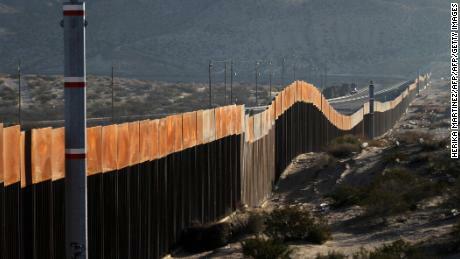 Years of eminent domain cases could further delay the wall, over private land that lies along the route. On Tuesday for instance, the North American Butterfly Association asked a federal court to halt border wall construction in the Rio Grande Valley, arguing that the work interferes with its property rights. But the political payoff from moving ahead may satisfy Trump for now, and allow him to declare he’s kept his promise as he campaigns for re-election. “The bottom line is, we’re building the wall,” Trump said Tuesday. CNN’s Kristin Wilson, Pamela Brown, Kevin Liptak and Kaitlan Collins contributed to this report.